It was a sunny midday sun after yesterday. After attending the church service at Koki Good Shepard Lutheran Congregation, I went to my office at the Waigani Main Campus, University of Papua New Guinea. I left my Bible and the Lotu Book at the office, got my camera and walked out of my office. I decided to tour the campus to see if there is any work or progress being done to prepare the place and the fields for the 2015 Pacific Games. I checked my watch for the time, and it was 12 pm sharp. I walked from my office down to the soccer fields near the Toa 6 boys residential area. The field was naked brown, except for the 4 goal posts that indicate that there are two soccer fields in place. There are tall grass blowing and whistling, producing musical tunes like sounds from the piano. I looked, and noticed that the ground was dry, and there are cracks due to the prolonged dry spell experienced here in Port Moresby. From there, I walked passed the rugby field as well, and observed the same things as in the soccer fields. There are no signs of improvement or upgrading being made to the fields in that part of the university. I continued on, between the Ulli Beier and the Open College Office, past the UPNG clinic and followed the track between Veari village and Toa 1, 2 and 3. I stood a few distance away and looked towards Lasitewa and Poroman Halls of Residence,where it houses the male second and third year students respectively. 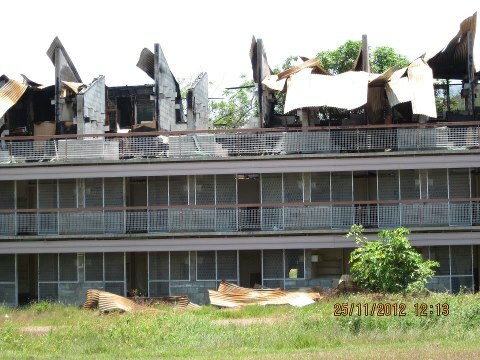 The burnt down Lasitewa Hall can be seen without any work done to renovate it as seen in the photograph. It was left alone just like that after the fire burn it down. I proceeded on, down towards the north east end of the campus, where the proposed games village will be built. I walked on, thinking that there are some ground work being done on that part. I continued, and noticed that nothing was done. The vegetation that was there were left intact, except for the tracks created by the Uniforce security when patrolling the area. From there, I walked back up, towards the Security base, and then towards my office. I observed that nothing has been done on the ground to show that Port Moresby and PNG is ready for the big sporting event. The University of Papua New Guinea is allocated every year by the government in its budget about 40 million Kina to run its affairs. That money is not enough to improve and provide more and better accommodations for its ever increasing number of students every year. This is due to the fact that almost 3/4 of that money is taken up by recurrent expenditure, and it is left with almost nothing to improve its services, recruit new and qualified lecturers, and renovate and re - stock the Sir Michael Somare Library as well as other lecture and tutorial rooms. The University really need this project to help in terms of providing better accommodation to its ever increasing number of student intakes every year after the Pacific Games and beyond. If I can remember correctly, and I stand to be corrected, the national government, under the Somare regime allocated about 500 million Kina to the PNG sports foundation to begin work on the renovation of the stadium, the training facilities and building of accommodation for the athletes at the University, since it will be the games village. Since then, nothing has eventuated up till now. It is 2 years now, and we have 2 more years before the games begin. Considering the example as seen in the PNG Games in Kokopo due to late preparedness, we have problems faced by the teams, as reported by the National Newspaper Today in its column section. This project needs honesty, accountability and trust from the National Government, the PNG Sports Foundation, the University Administration, and the contractors to make it happen for the benefit of the countries participating, and for the new students, who will be our relatives or family members coming in to UPNG for studies beginning 2015 and beyond, as accommodation here at UPNG will be scarce if nothing is done. I hope this project gets going beginning next year.